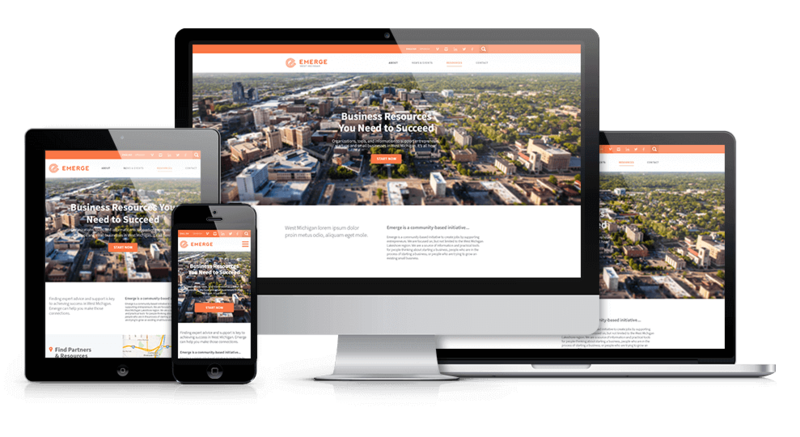 Emerge | Kmotion Design Inc.
Emerge is an online community based resource for business assistance in West Michigan. We designed the Emerge logo, branding, and website. We established a powerful way for users to find resources they need, by creating the interactive resource map and partner grid in an easy to use responsive website. "One of our favorite logos to create." The site was build in Kentico, and uses Kentico’s powerful features and analytics, to create a robust backend that makes a seamless experience for its users to find what resources they need. We designed the Emerge logo and branding, through many iterations. The final logo is made up of lines that merge into to form an E. The brand colors are bright and reflect the colors of sunset on the lakeshore of Lake Michigan.